It is only a matter of time before our beloved Smart Gilas represents the Philippines at the FIBA tourney in Spain. Max's has show their full support for the national team by launching the Gilas Favorite Delivery Treat. 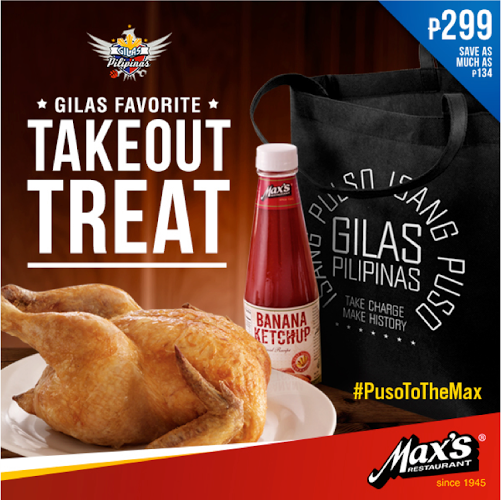 For only P299, you are getting a Max's whole chicken, bottle of banana ketsup and Gilas Eco bag. Don't forget to take a picture of this awesome treat and use the #pusotothemax every time you post it to your social media accounts. Meanwhile the "Dito Galing and Gilas" campaign has ended and Max's announced two lucky winners to Spain next month to watch the Gilas play along with pocket money. The winners are Pauline Vislenio and Jennifer Tayag Duenes. Contact Max's right now and find out the next steps on the road to Spain.